Some topics are so politically charged that even to attempt a discussion online is to invite toxicity and rigid disagreement among participants. But a new study finds that exposure to the views of others, minus their political affiliation, could help us overcome our own biases. Researchers from the University of Pennsylvania, led by sociologist Damon Centola, examined how people’s interpretations of some commonly misunderstood climate change data changed after seeing those of people in opposing political parties. The theory is that by exposing people to information sans partisan affiliation, we might be able to break the “motivated reasoning” that leads us to interpret data in a preconceived way. 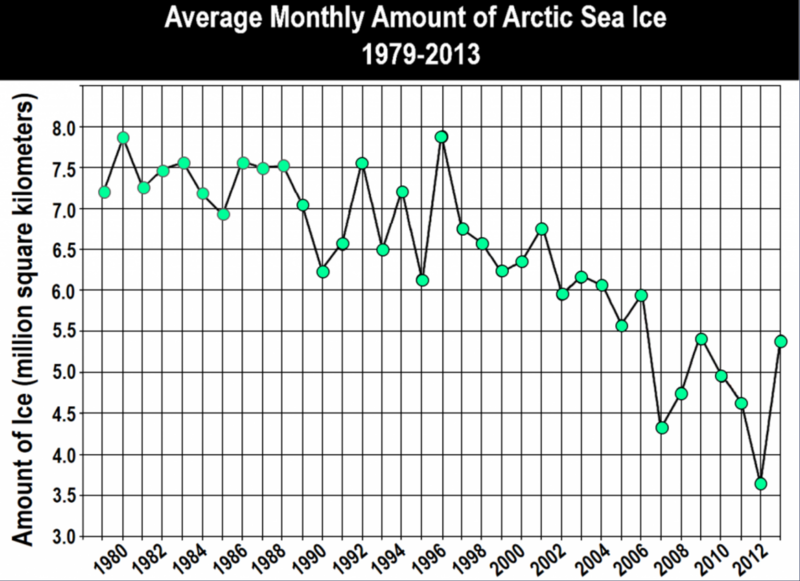 The data in this case was a NASA study indicating that sea ice levels will decrease but frequently misinterpreted as suggesting the opposite. The misunderstanding isn’t entirely partisan in nature: 40 percent of self-identified Republicans and 26 percent of Democrats polled in the study adopted the mistaken latter view. The NASA graph used in the study. As you can see it’s not crazy to think that the sea ice levels would increase, though it is incorrect. Thousands from both parties, recruited via Mechanical Turk, were asked to indicate whether sea ice levels were rising or falling, and how much. After their initial guess, they were shown how others had answered and allowed to adjust their answer afterwards. Some were shown their peers answers with those peers’ political affiliation, and some were shown it without. When political party was not attached to the answers, there was a considerable effect on people’s answers. Republicans jumped from about 65 percent getting it right to around 90, and Democrats went from 75 to 85 percent. When party was shown, improvements were much smaller; and when people were only exposed to those from their own party, there was practically no improvement at all. Obviously this isn’t going to fix the problem of viral misinformation or the near-constant flame wars raging across every major online service. But it’s amazing that doing something as simple as stripping the political context from communications may lead to those communications being taken more seriously. Perhaps something along these lines could help put the brakes on runaway articles: showing highly-cited views from people with no indication of their political beliefs. Will you be so quick to dismiss or accept someone’s argument if you can’t be sure of their agenda? At worst it may force people to take a second and evaluate those ideas on their merits, and that’s hardly a bad thing.